Ryan 40. Linoleum block print on wove paper with Basingwerk – Parchment watermark. Signed and titled in pencil. Stamped “Federal Art Project, NYC, WPA” and numbered 7 lower right. A Russian immigrant who settled in New York in 1920, Jacobi is best remembered for the block prints he made for the Graphic Arts Division of the Federal Arts Project of the WPA. Jacobi prints are very rare, having been hand printed in small editions by the artist. Like most of his prints, Cherries depicts life in the poor Bowery neighborhood and the impact of the Depression. 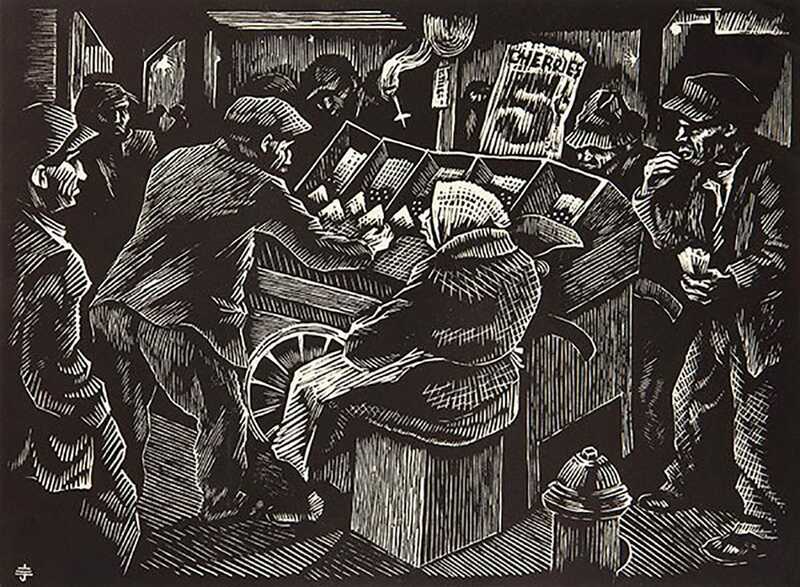 Jacobi lived in the Bowery and called his series of prints The Street of the Forgotten Man.